As Internet titans seek to distribute large files to support videos, gaming and virtual reality, the center of the country is proving to be the ideal place to add data center capacity. This trend is spurring a data center building boom, pumping billions of dollars into towns across America’s heartland. 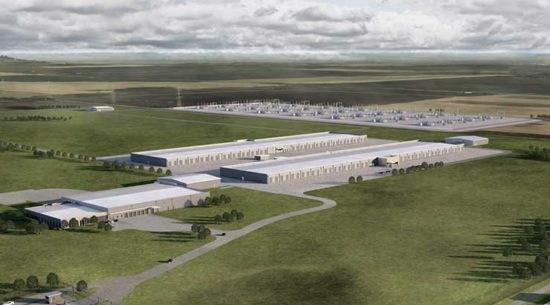 Five large cloud companies – Apple, Google, Amazon, Microsoft and Facebook – are investing more than $11 billion to build massive server farms across Iowa, Ohio and Nebraska. Procuring green energy has become a priority for cloud builders, who use enormous amounts of electricity as they consolidate enormous volumes of business activity inside their walls. In 2016, data center providers signed contracts for more than 1.2 gigawatts of renewable power. 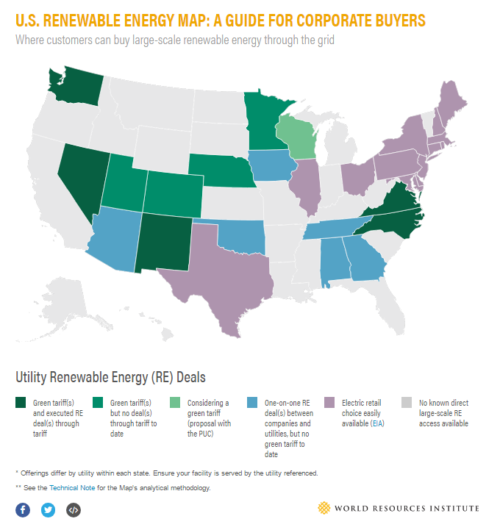 The U.S. Renewable Energy Map: A Guide for Corporate Buyers reveals where corporations can access the renewable energy they want at the scale they need through their utility. The map tracks renewable energy purchasing options in different states, including green tariff programs and other utility renewable energy products. Buyers use the map to inform decisions on where to site new facilities, prioritize their renewable energy purchasing strategies, and ultimately meet their clean energy goals. The map also compares each product to the Corporate Renewable Energy Buyers’ Principles. Nebraska’s available products meet all 6 principles: Choice, Cooperation, Cost-Competitiveness, Financing Tools, Long-Term Pricing, New Projects. This entry was posted in Nebraska / Midwest News, NewsBlog and tagged Corporate Renewable Energy Buyers' Principles, data centers in the Midwest, data centers' procurement of renewable energy, Nebraskans for Solar, U.S. Renewable Energy Map on August 30, 2017 by Helen Deffenbacher.